Will some corals be able to adapt to these rapidly changing conditions? If so, what will these coral reefs look like in the future? 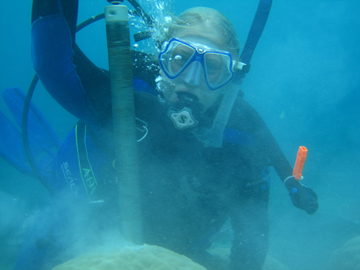 Now, in time for World Oceans Day on June 8, 2015 scientists are studying coral reefs in areas where low pH is naturally occurring to answer questions about ocean acidification, which threatens coral reef ecosystems worldwide. 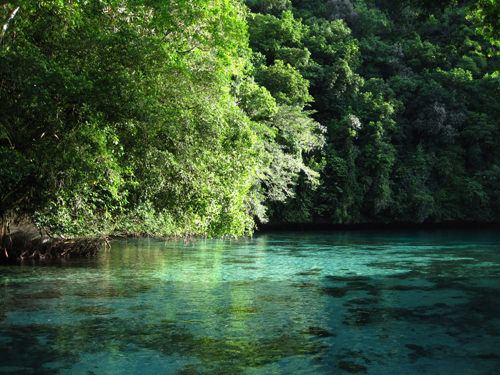 Seawater pH in Palau's Rock Island bays is as low as the open ocean may be at this century's end. : Photograph by Hannah Barkley courtesy of NSF. A new study led by scientists at the Woods Hole Oceanographic Institution (WHOI) found that coral reefs in Palau seem to be defying the odds, showing none of the predicted responses to low pH except for an increase in bioerosion--the physical breakdown of coral skeletons by boring organisms such as mollusks and worms. Coral bioerosion, including these borings made by bivalves, increases during ocean acidification. : Photograph by Hannah Barkley courtesy of NSF. "Contrary to laboratory findings," says Garrison, "it appears that the major effect of ocean acidification on Palau Rock Island corals is increased bioerosion rather than direct effects on coral species." When the researchers compared the communities found on Palau's reefs with those in other reefs where pH is naturally low, they found increased bioerosion was the only common feature. "Our study revealed increased bioerosion to be the only consistent community response, as other signs of ecosystem health varied at different locations," Barkley says. How do Palau's low pH reefs thrive despite significantly higher levels of bioerosion? They also don't completely understand why conditions created by ocean acidification seem to favor bioeroding organisms. One theory--that skeletons grown under more acidic conditions are less dense, making them easier for bioeroding organisms to penetrate--is not the case on Palau, Barkley says, "because we don't see a correlation between skeletal density and pH." 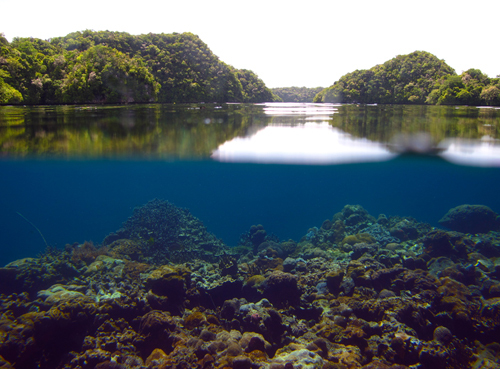 Coral reefs under low pH conditions in Palau are still diverse and have high coral cover. : Photograph by Hannah Barkley courtesy of NSF. 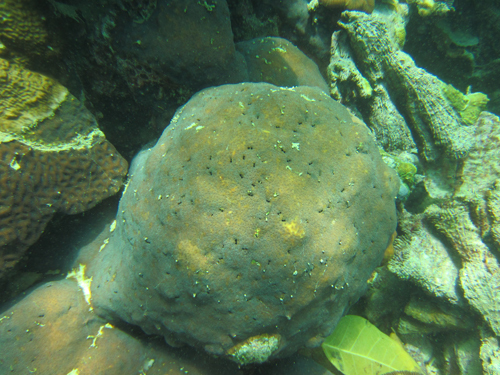 Huge Porites corals are relatively healthy throughout Palau waters. : Photograph by Hannah Barkley courtesy of NSF. Abstract from Changes in coral reef communities across a natural gradient in seawater pH, BY HANNAH C. BARKLEY, ANNE L. COHEN, YIMNANG GOLBUU, VICTORIA R. STARCZAK, THOMAS M. DECARLO, KATHRYN E. F. SHAMBERGER | SCIENCE ADVANCES 05 Jun 2015: e1500328: Coral reef community responses vary but bioerosion increases under natural ocean acidification. Note: This is an open access article. 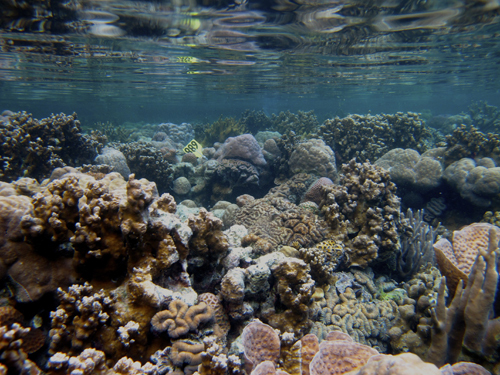 Ocean acidification threatens the survival of coral reef ecosystems worldwide. The negative effects of ocean acidification observed in many laboratory experiments have been seen in studies of naturally low-pH reefs, with little evidence to date for adaptation. Recently, we reported initial data suggesting that low-pH coral communities of the Palau Rock Islands appear healthy despite the extreme conditions in which they live. Here, we build on that observation with a comprehensive statistical analysis of benthic communities across Palau’s natural acidification gradient. Our analysis revealed a shift in coral community composition but no impact of acidification on coral richness, coralline algae abundance, macroalgae cover, coral calcification, or skeletal density. 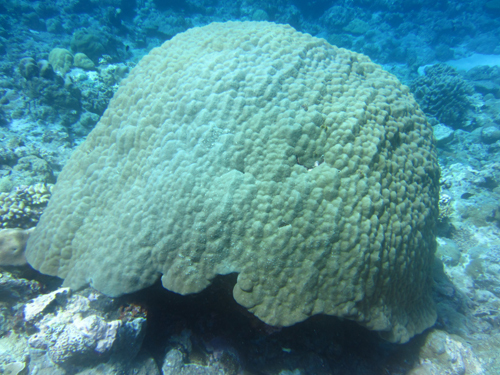 However, coral bioerosion increased 11-fold as pH decreased from the barrier reefs to the Rock Island bays. Indeed, a comparison of the naturally low-pH coral reef systems studied so far revealed increased bioerosion to be the only consistent feature among them, as responses varied across other indices of ecosystem health. Our results imply that whereas community responses may vary, escalation of coral reef bioerosion and acceleration of a shift from net accreting to net eroding reef structures will likely be a global signature of ocean acidification. This news is from the National Science Foundation June 5, 2015. This article was published on the Horizon International Solutions Site on 7 June, 2015.